Mark your calendars and join us on Tuesday, April 30th for East Texas Giving Day! Proceeds this year will help us refresh HomePlace, our inpatient facility, because "There's no place like HomePlace!" 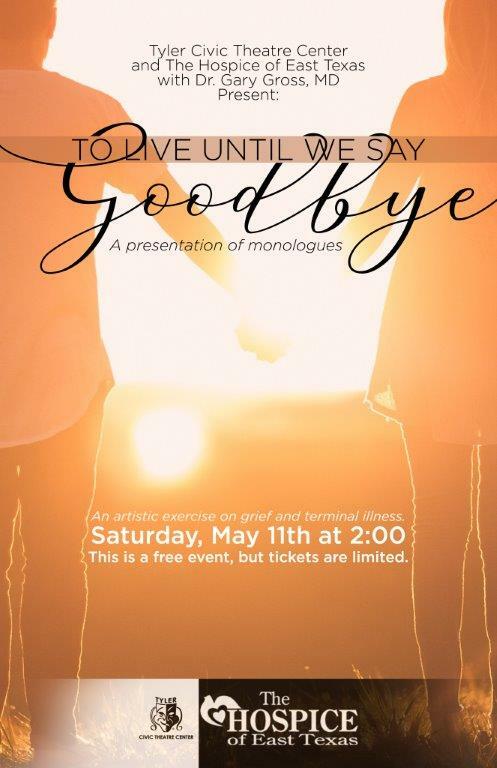 "To live until we say Goodbye - a presentation of monologues"
Saturday, May 11th at 2pm. Tickets are free, but required. Contact the Tyler Civic Theatre box office (903-592-0561) for your tickets. Click here for more information. Interested in volunteering...we have training for new volunteers coming soon. Click the "volunteer" button above to find out more. Hospice of East Texas is accredited under the CHAP Hospice Standards of Excellence. Hospice of East Texas has been accredited by CHAP since 2004. CHAP accreditation demonstrates that The Hospice of East Texas meets the industry's highest nationally recognized standards. Rigorous evaluation by CHAP focuses on structure and function, quality of services and products, human and financial resources, and long term viability.